With today’s economy homeowners are continually trying to save money and improve the value of their homes. Often they decide to take on various home projects themselves instead of hiring a professional. What most homeowners don’t realize is they may be required to hire a professional engineer for certain home additions and some home improvement projects. Many local and some state and federal agencies require detailed plans which can only be completed by a licensed professional. 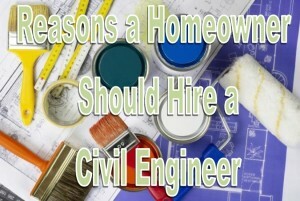 Most homeowners don’t realize they need an engineer until they have already started their projects or they run into problems they can’t handle on their own. Plot Plans/Permits – A homeowner may require a plot plan to determine property improvements, easements, and utility locations. An engineer can provide these along with construction staking and drainage analysis. New Home Construction and Renovations – An engineer can design and plan a homeowners new home or renovation projects. From beginning to end, the knowledge and experience of an engineer is invaluable for new construction and renovations to existing structures. Septic and Sewer Projects – Civil engineers can design all types of on-site septic disposal systems. The local governing health departments have specific standards that become the basis of the civil engineer for new or renovated system designs. Drainage – Whether it is designing new or redesigning existing stormwater drainage or solving isolated drainage problems, a civil engineer can perform a comprehensive investigation to find out what options a homeowner may have to diminish a problem or prevent one from transpiring. Retaining Walls and Landscape Plans – Many local agencies have specific requirements when it comes to retaining walls and landscaping. Some requirements might include the height of a retaining wall or the approved placement of landscaping plants and trees. Civil engineers can provide their knowledge to homeowners to ensure they are following standards and not in violation of any codes or regulations. Structural Inspections and Assessments – Often times a home will require a structural inspection or assessment. An engineer can provided certified inspections and assessments, providing reports and recommendations which can be used by the homeowner. Project Oversight – Civil engineers can provide project oversight to any project from concept to completion. Building Code and Zoning research – Since civil engineers are continually working on various projects in varying jurisdictions, they are knowledgeable of building codes and zoning ordinances. They can provide homeowners detailed information to keep the project in compliance and ensure the proper procedures are being followed. Permitting Applications – When it comes to permitting, homeowners are often overwhelmed with the forms and processes required. Civil engineers are familiar with permitting processes and can provided assistance with such. They can also provide a homeowner with representation at meetings and answer questions about the project helping the homeowner and making sure everyone has a clear understanding of the project. Any homeowner planning a home improvement project should consider hiring an engineer to assess their project before they start. An engineer’s expertise and guidance can save a homeowner time and money in the long run.